Here’s the Founder card, purchased at great expense! Most of these were crumpled up, lost or just thrown away! As regular visitors to the blog will know, I was pipped to the post by the author of ‘Puffin by Design’ for one of these a while ago, and it took a fair bit of searching, waiting, and just plain luck to get hold of this. This one needed a fair bit of restoring to its current minty fresh look. It’s a great example of Jill’s lovely calligraphy and a great way to see both styles of her graphic design work. I have one of these! I am glad you are still posting these great items here. I wanted to share my good news. I knew I once had a 'Puffinthink book' (you posted a beautiful picture of yours some time back) but I thought I'd lost it. Yesterday I found it, tucked behind some photo albums – but the best thing was – and this I had totally forgotten – it's signed by Kaye Webb! 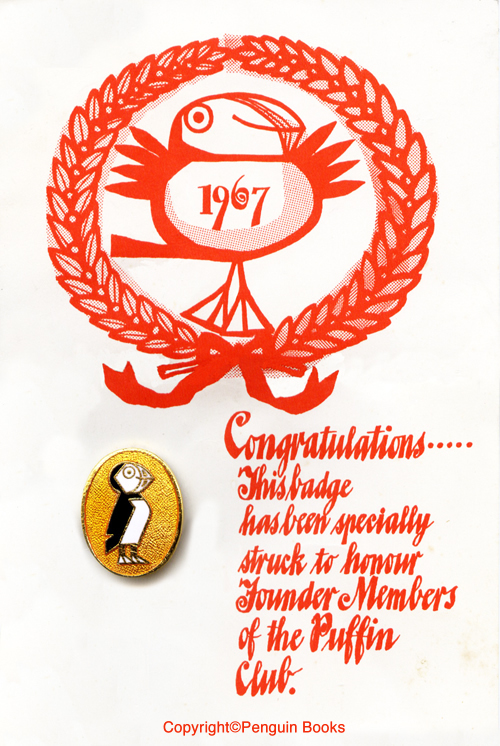 I was given it on the first Puffin Club holiday (at Featherstone Castle in Northumberland) at New Year 1970 when I was 10. I still have the article that appeared in the Observer about that holiday. I was lucky enough to win a place (it was a random draw, as I recall).